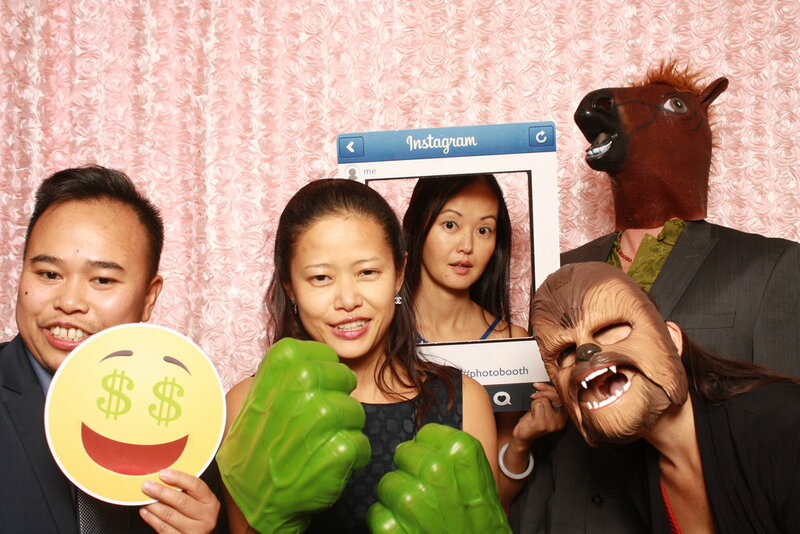 Jessica & Jayson's wedding reception at the Oasis Centre in Edmonton was SO MUCH FUN! The Oasis Centre is a beautiful for weddings, corporate functions, and other events. It's elegant and spacious! It's even won awards from the Canadian Industry Wedding Awards for best overall wedding venue in Alberta! It's easy to see why Jessica & Jayson chose it for their wedding. In addition to choosing the perfect wedding reception venue to wow their guests, this fun couple decided to have a photo booth from Ready Set Booth as well! Their goal was to have a unique, fun, and entertaining experience for all of their family and friends. Look at the first photo below...what do you see? 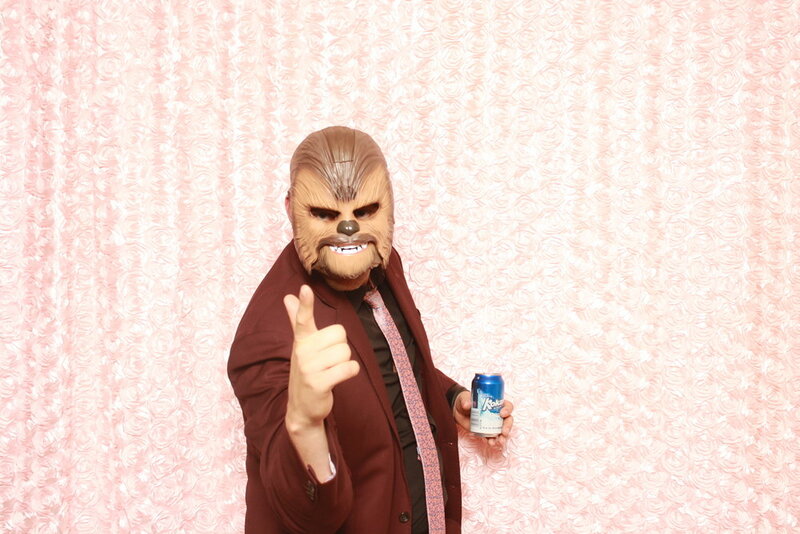 One of the BEST features of the Ready Set Booth photobooths! Can you guess what it is? I'll give you a hint...how many people are in that photo? I actually don't know the answer - it's hard to tell what's a mask and what's a person on a few of those faces...but I can count at least 12! 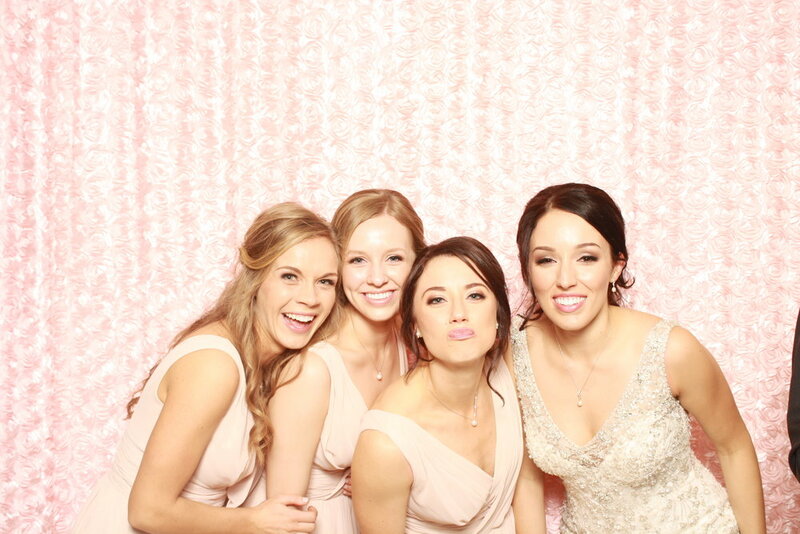 Our photobooth gives you the flexibility to invite so many of your friends into your photos! The open-air style booth is perfect for large groups. Another thing you may notice from these photos is how well coordinated the pink rosette backdrop is with the wedding! Jessica's bridesmaids work pale pink dresses, and their wedding incorporated this colour beautifully. Having a matching backdrop added an elegant touch to the wedding. Make sure to have a look through the blog and website to check out all of the backdrop options that Ready Set Booth can offer for your function. Do you want something unique or custom? Just send us an email and we can chat with you about what will work best for your perfect wedding reception photo booth!